I’m letting go of the idea that 'policy' and 'delivery' are separate things. And, I’m not alone. The space between policy creation and delivery has been called 'The Valley of Death' – and many have tried to cross it. But I believe policy and delivery should be seen as one and the same. For me working in multi-disciplinary teams is all about singular 'ownership': from concept, to implementation, to continuous improvement – without the divvying up of responsibilities that's central to the traditional civil service model of policy and delivery. And making decisions in these multi-disciplinary teams is incredibly satisfying. We’ve been thinking about 'service ownership' in DfE and came up with a way of visualising it which we hope is helpful. We started with some simple sketches which eventually became a big picture on the wall. Then we made a simplified diagram of the most important bits. 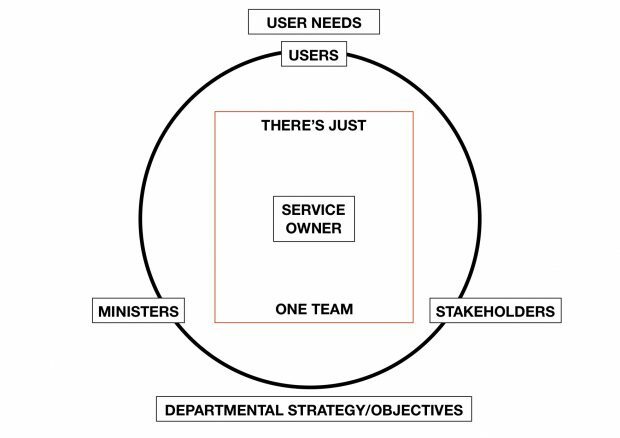 The circle is the domain of the service team (and therefore the service owner). It's the things they are responsible for. Teams that call themselves 'policy teams' will feel happier in the lower half (which captures, for example, policy creation, press, parliamentary and ministerial handling). 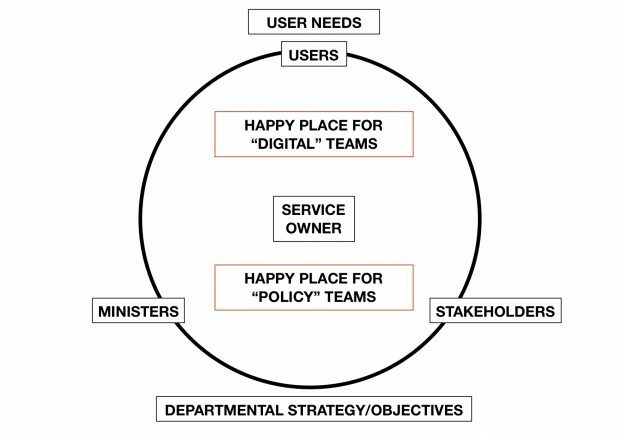 Teams that call themselves 'delivery or digital teams' are likely to feel more comfortable working in the upper half of the circle (which includes service design, operational comms and user support). The big change here is that the service owner is responsible for all of it, for the policy and the service that users experience it through. So there's no divide between policy and delivery; or between delivery and the maintenance and improvement of the live service. That doesn't mean people can't be working anywhere within it, however they like. What matters is meeting user needs by making sure policy objectives can adapt and respond to user research. In the photo, you'll see that the circle representing the service doesn't exist in isolation. It's surrounded by other things that affect it, or influence it. Departmental influences are on the left - everything from HR to Estates. External, third party influences are on the right - from Parliament to stakeholders. The point this sketch is trying to make is that we're all involved. The team working within the service is multidisciplinary. It includes people who created the policy, and it includes people who understand best practice in delivery. The service owner is the team leader. They are empowered to make decisions about everything that happens within the service, inside that circle. Even if they're not officially the line manager for all the people who work within it. This model of service ownership has already been used to build real services. The 'Find a job in teaching' service is a good example. That service makes it easier for schools to advertise posts free of charge, meeting the policy objective of saving some of the £75 million spent per year on advertising for full time teaching posts. It was created by a multidisciplinary team of policy and delivery specialists, working side-by-side to meet user needs. It could not have been done any other way. 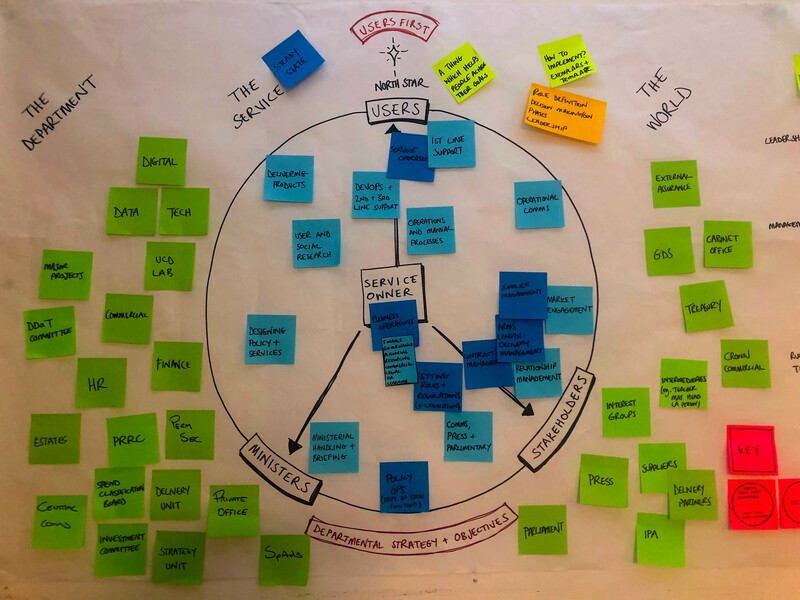 The model I've described in this post is a tool, designed to help us explain new working practices to our colleagues and leaders. Like most things, it's a work in progress; but we’ve found it useful as a visual aid, and a useful prompt for further discussion. It’s also been a template for change: we’ve started building real services, for real users, by applying this approach. That feels like a step in the right direction. Rachel Hope is the Deputy Director for Teacher Services. If you want to find out more about our service ownership model let us know by leaving a comment. Or you can follow Rachel on Twitter. What did it take to achieve this multi-disciplinary approach, led by a service owner? Hello Harry. It has helped to have senior sponsorship - from both policy and delivery teams. Emma Stace (DfE Director of Digital and Transformation) and Heather MacNaughton (Director of Teaching Workforce) both champion the model. Together, they have recruited service owners - then put trust in the teams to deliver. We're still learning, but it's great to work in a department where you're supported to create user-centred services, with a real focus on policy outcomes. This is great! The role of service owner is something the service communities team at GDS have been looking into for some time. Does the role of the service owner in this context also involve collaborating with other departments who are delivering similar services? It does! This is vital. It means we can make things easier for users to do the things they need to do - creating journeys that cross departmental borders. It also means we can share learning, insights, tech and much more.